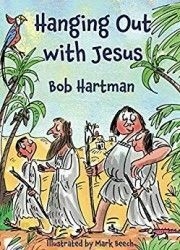 This is a new book from Authentic Media and author Bob Hartman to introduce young readers to the stories of Jesus found in the Gospels. You may well already be familiar with Bob Hartman because he has sold over a million books and has written, amongst others, The Lion Storytelling Bible, as well as this he regularly reads his stories and shares at Christian and other literary festivals around the world, including Spring Harvest. When our young people have a variety of entertainment sources at their finger tips it can be hard to engage them with books, and especially with books about the Bible. This is where parents have an opportunity to share with their kids encouraging reading before bedtime which can be great bonding time. Even then Bible stories are often up against competition from Horrid Henry or Captain Underpants or any number of cleverly written books that appeal to a certain sense of humour at that age. So this is where Bob Hartman steps in with this storybook of Bible Stories called "Hanging Out With Jesus" which details the journey of three of Jesus' disciples watching the amazing things that He said and did. This book starts with Jesus turning water into wine and moves through various key elements of Jesus ministry including the raising the son of the Widow of Nain, Jairus Daughter, Legion, Jesus walking on water and the transfiguration. All these stories are told by Pip and mainly involve Big Bart, Tommo and, of course, Jesus. These characters are based on the disciples Philip, Nathaniel (sometimes called Bartholomew) and Thomas. What Bob does is takes the basics of the stories and keeps them accurate to the Bible text but then brings in the context of the characters. For example, the first story called wine actually doesn't have Tommo as a disciple at this point. He is actually the wedding planner who has run out of wine. Fearing for his career he doubts that anything can happen, but when he sees the miracle happen in front of his eyes he decides to become a new friend and student of Jesus. So from here on in we have Pip who is inquisitive, Tommo who wonders if Jesus could be the promised one and Big Bart who provides a bit of comic relief. "If I was a butterfly," said Tommo, "I wouldn't want you patting me on the head." "If I was a butterfly," I said. "I wouldn't want you anywhere near me." "If I was a butterfly," said Bart, looking wistfully at the sky, "I'd thank the Lord for giving me wings." There is a certain amount of grossness to many of these stories which leads me to think that they may well be more directed towards and audience of the younger boys, but it's still very accessible to all. There are some quite zany illustrations for each story from Mark Beech with a few images per story to break them up and the stories are kept fairly short, around 15 pages of a good sized print, lots of white space around and certain expressive words that stand out through the text as well as the illustrations and this makes them ideal for a short bedtime story or a self-read for age 6+ (my estimate only). There's a lot to like here, the stories may not exactly be as the Biblical text, but there is a lot here to bring the Bible to life. There are some elements that can be used as springboards for talking about concepts like Heaven, faith, miracles and more if you want to take things further with your kids. There is even the foreshadowing of what there may be to come for Jesus in Jerusalem and lots of nods to other Old Testament stories too. If you struggle to get your young kids to engage with the Bible then this has everything to make it fun whilst bringing the lessons from their adventures.